When it comes to visiting the dentist, a lot happens before the dentist ever looks into a patient’s mouth. Much of this preparation is done by a dental assistant, and can have a big impact on a patient’s experience. A dental assistant can have a wide range of tasks to accomplish, depending on the office they work in. After checking in with a receptionist, a dental assistant is usually the first person a patient comes face to face with, and they can set the tone of the whole visit. One of the key things a dental assistant does is to help a patient feel comfortable during their visit. This requires great interpersonal skills, as well as care in making sure the dental chair is comfortable. Throughout the visit, the dental assistant can show care in making sure the patient doesn’t experience any pain or discomfort, including using a suction hose or water hose to dry or moisten the patient’s mouth as needed. In some cases, a dental assistant might offer sunglasses for the bright overhead light, a blanket, or even a movie to watch during the visit. 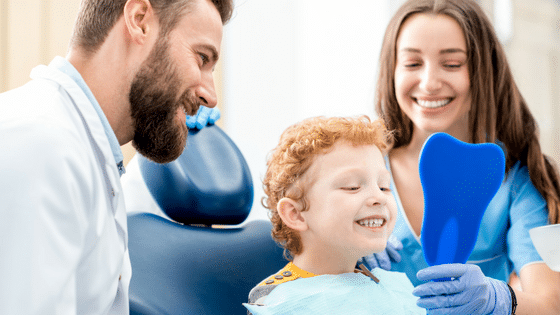 For child patients, a dental assistant can explain what they are doing and why, and help make the dental instruments and procedure noises less threatening. Dental assistants often take and process X-rays, under the direction of the dentist. Depending on the office, they may help with other lab tasks such as taking impressions of teeth or preparing materials to create temporary crowns. Most often, dental assistants take care of the cleaning of a patient’s teeth, before they meet with the dentist. Coronal polishing, plaque removal, and flossing are all common tasks performed by a dental assistant. They may also apply fluoride or a topical anesthetic. When the dentist performs examinations or procedures on a patient, the dental assistant performs the important role of handing instruments to the dentist. These procedures could include fillings, crowns, extractions, or applying sealant. Dental assistants are also often responsible for creating records and taking notes during the dentist visit. In general, dental assistants help the visit to go as smoothly and comfortably as possible. Behind the scenes, dental assistants are busy with a number of other tasks. Often, dental assistants will sterilize dental instruments, as well as prepare the proper instruments for each procedure. They may even assist in scheduling dental appointments and billing patients, depending on the office. As a career, dental assisting is a field with a better than average employment outlook. According to the Bureau of Labor Statistics, employment of dental assistants is expected to grow 19 percent over the next 8 years. Dental Essentials School of Dental Assisting Salt Lake City can provide you with all the training and education you need to step into this exciting and growing career.